There will also be an Amateur Event (for returning and new adult players whom have not been involved in the SG Premier League before), WASPA-style Team Open and WASPA Individual Open (Plate) events over the 2 days of competition. Program for the two days will be updated later. 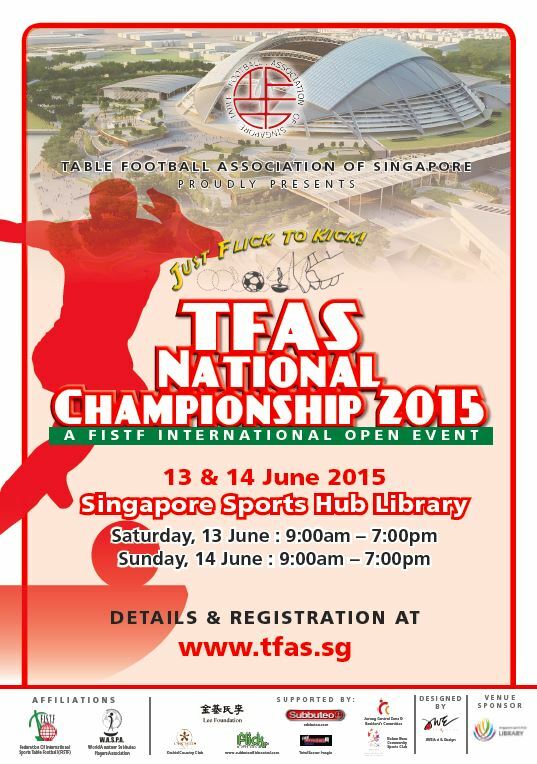 ** Note that the above Individual Events are FISTF ‘International Open’ Events. The Open Individual Plate Event is a WASPA Event; while the Open Team Event is a WASPA-style Event. Participants will be allocated into the respective teams on the day itself. Note: Wait-List requests can still be submitted after the above Closing Date. However, acceptance of the request and an additional ‘late registration levy of $5’ may be imposed as condition for acceptance. These shall be at the absolutely discretion of the organisers. TFAS Merlion Cup 2017 … Registration is opened !! We hope to have players from around the world participating in this event to help us showcase our sport – Table Football – to the rest of the sporting community in South-East Asia!! Registration Fees can be found here. TFAS National Championships 2017 Open for registrations NOW!!! Registration is only confirmed upon payment. TFAS CUP 2017: Registration are now Open!